USING their highly effective Lancia Beta Monte Carlo car to dominate two seasons of sports car racing, Lancia, under the guidance of manager Cesare Fiorio, became World Champion in both 1980 and 1981. 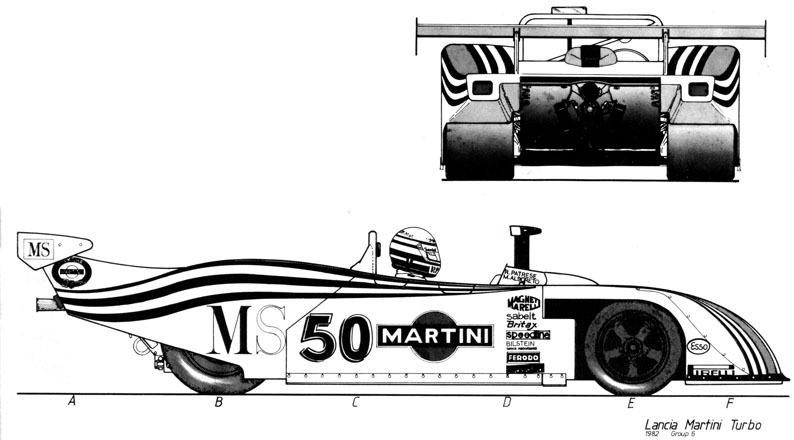 For 1982, Lancia, wanting to continue development of their 1.4 litre turbo charged engine, decided to take advantage of the FISA rules which allow under two litre Group six cars to run alongside the new Group C cars for one season, to bolster the entry lists. during its introductory year. The Lancia team used their engine in 1425cc form as the basis for the new Martini sports car, designed and engineered by Dallara. This car features a conventional deep bath tub monocoque, very light in weight at only 640 kilos, (only 75% of the weight of Group C cars) and with the engine producing around 450 bhp this gave the car a superior power-to-weight ratio over its rivals. On top of this advantage, Group Six regulations allow full ground-effect cars complete with skirts. With these down to ground level the cars were able to out-brake and outcorner the opposition. The monocoque is suspended at the front by braced single top links, lower wishbones with outboard coil spring damper units and anti-roll bar. At the rear, top wishbones and wide-based lower wishbones operate with outboard coil spring damper units and anti-roll bar. The Lancia team have worked and tested with Pirelli tyres for three seasons now, Pirelli producing special race and qualifying tyres for this season. The team ran their distinctive bodywork all season, complete with the extended tail sections and fully-faired rear wheel arches. The wind tunnel testing of this bodywork produced two nose sections for the car. One, concave, for slow circuits giving greater downforce than the other nose with its convex section for fast circuit use. The team is sponsored by Martini for the second successive year and the cars are painted in white overall with red and two-tone blue striping over the front and rear wheel arches. MS cigarettes also assist with the sponsorship. The rear wing is unpainted aluminium and the wheels are matt black; team cars were numbered 50, 51 and 52, competition numbers that they retained all season. Manager Cesare Fiorio retained his talented team of drivers from last year, keeping them for the full season; the all-Italian team is led by Riccardo Patrese with Michele Alboreto, Teo Fabi and Piercarlo Chinzani for support. The team's first race in 1982 was the Monza 1000 Kms. The cars, fitted with their standard concave nose sections, qualified comfortably on the front row of the grid. The Patresel Alboreto car led the race for four hours, until stopped by a faulty distributor, while the second team car was delayed twice with tyre trouble and a holed radiator that needed to be changed; it, too, finalIy stopped with distributor trouble. The Silverstone Six Hour race was the next event, Chinzani recording the team's fastest time in practice, qualifying second behind the new Group C Porsche of Jacky Ickx. Patresel Alboreto led for 1 Y:z hours before stopping to change a wheel and a damaged tail section, the result of touching another car while overtaking. Chinzanil Fabi then led for the next two hours until stopped by engine trouble, Patrese then led all the way to the finish, although he lost the use of his clutch during the closing stages. For the Silverstone event, the Lancia team had used their new streamlined front nose section, but returned to use the standard nose for the next race at the Nurnburgring where the extra downforce was required to hold the car around the twists and turns of this famous circuit. Patrese had a horrifying practice accident when his car left the road, touched the grass bank, and cart-wheeled down the road to land upside down. Patrese was knocked out but, apart from hospital treatment for shock, he was suprisingly free of injury. After this accident, Fiorio changed his driver line-up for the race, Fabi co-driving with Alboreto, and Chinzani becoming lead driver in the first car with Patrese, still recovering, driving only the mid section of the race. Chinzani led the opening lap until he was forced to stop with a puncture, he then chased the leaders for two more laps when the car stopped for good with a broken gearbox. Patrese was then switched to the other car to drive the final hour to claim his driver's championship points. Patrese had now won three - major FIA World Championship events on consecutive weekends; between his Silverstone and Nurnburgring wins he had won the Monaco Grand Prix for Brabham. The team now moved on to the Le Mans classic 24 hour race. The cars ran with their streamlined nose cones, now fitted with headlamps and a new rear wing giving less downforce and drag, for use along the Mulsanne straight. The regular drivers were supported for this event by Hans Heyer joining Patresel Chinzani in car No. 50 and Rolf Stommelen teaming with Alboreto/Fabi in No. 51. Much was expected of the Lancia team in the opening hours of the race after they had proved their speed around the circuit during practice to qualify in fourth and fifth places on the grid. The start of the 1982 Le Mans was a disaster for the team, both cars suffering fuel pump problems. Alboreto stopped out on the circuit for over an hour before he was able to get the car back to the pits. The Patrese car lost over 50 minutes there and at the end of the first hour the cars were in 52nd and 53rd positions with four laps and only one lap completed. The Alboreto/Fabi/Heyer car continued for seven more hours to reach 26th position before retiring with a blown engine. The Patrese car ran very well and very fast for nearly 15 hours to reach 22nd place before his car, too, succumbed to turbo problems. Le Mans has never been a successful circuit for the Lancia factory and this year proved no exception. After the 1955 season Lancia withdrew from road racing completely, the endurance racing cars were abandoned and the Grand Prix racers sold to Ferrari. Throughout the 1960s and 1970s Lancia focussed on the Wold Rally Championship with a lot of success. The Lancia Fulvia, Stratos and other cars used are still considered the most legendary of all rally racers. The rally success inspired Lancia to return to road racing at the end of the 1970s. Lancia's first all-new road racer in over 20 years was the Beta Monte Carlo silhouette racer. It was powered by a 1.4 litre turbo-charged four cylinder engine, making it eligeble for the under-two-litre category of the Group 5 class. It excelled like the make's rally racers and won the 1979, 1980 and 1981 class World Championship. 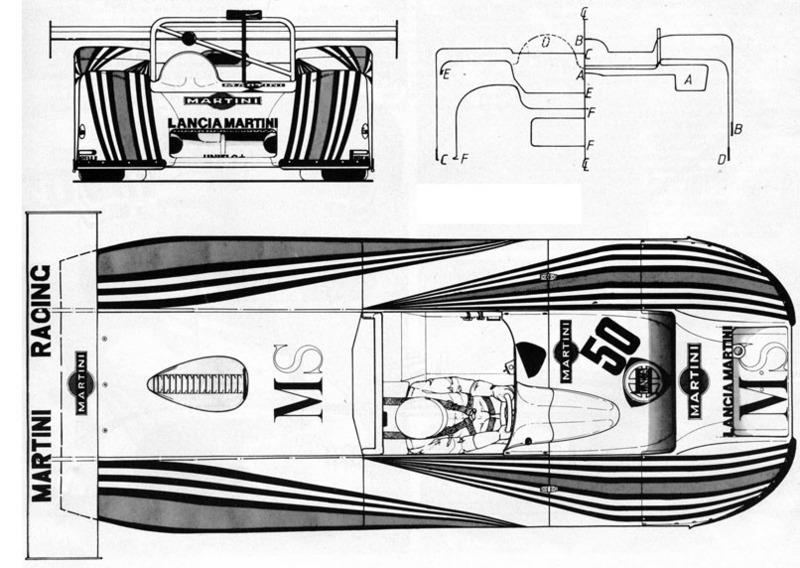 Lancia decided to up the ante and go for overall victories with a new race car for the 1982 season. 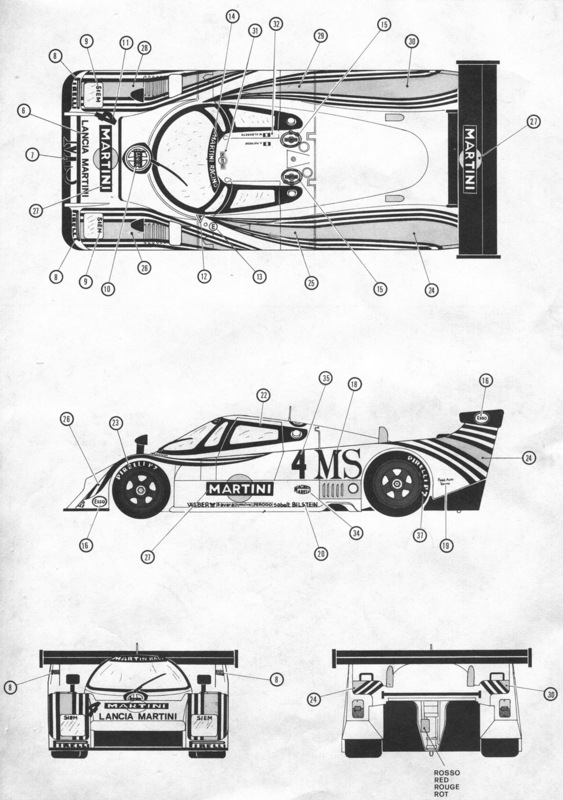 A new prototype racing class was launched for the 1982 season; Group C.
To take on the Porsches, Lancia needed a much bigger engine, bigger than any engine they had available. As with the Stratos of the 1970s, Ferrari was picked as an engine supplier. The engine was based on the 32 valve V8 engine used in the 308 QV, downsized to displace 2.65 litres and fitted with two KKK turbochargers. The displacement was not randomly picked, but specifically chosen to make it a potential Indy car engine as well. Abarth was chosen to fine-tune the engine. In its final 3-litre form it produced in excess of 850 bhp at full boost in qualifying trim. The V8 was bolted directly onto an aluminum monocoque as a stressed member to form the heart of the new LC2. Responsible for the chassis design was Gianpaulo Dallara. The LC2 body was made from carbon-fibre and kevlar. Three cars were entered in the 1983 running of Le Mans against 9 examples of the proven Porsche 956. In qualification two of the LC2s were almost on par with the 1982 winners, resulting in a second and fourth starting position. The speed was clearly there, but the LC2's reliability record was not. 1984 LC2s were stunningly quick in qualifying, resulting in a front row qualification for the two works cars. After leading the race, it all went sour again for the Lancia team. Bob Wollek did manage to record the race fastest lap in the LC2 he shared with Alessandro Nannini, but teething gearbox problems hampered them throughout the race. 1985 and more modifications and with 850 bhp on the tap, the Nannini/Wollek car qualified third on the grid. After a good start the LC2 stormed to the front and led for the first three laps, but again engine related problems struck the cars they finished sixth and seventh. 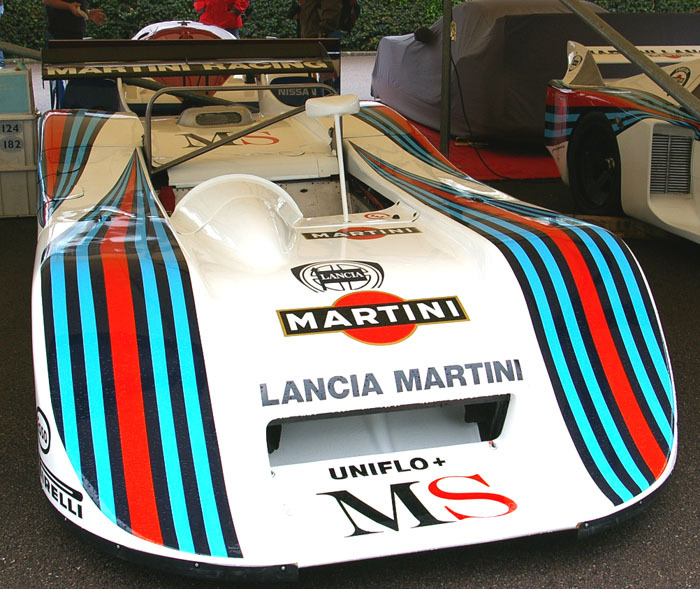 The LC2 was the only Italian car ever constructed for Group C racing. Will Lancia ever race again?